Jenny is available for speaking engagements at schools, clubs and churches. Below are a list of topics she can speak about and workshop. These can be modified to suit the audience. Jenny can speak to Prep students through to adults. She can work with a class through to a year level/lower, middle, upper students. Fees are charged at the Australian Society of Authors rates. Included in the fee is a set of Jenny's books. Please contact her via jenny@jennywoolsey.com if you have any queries or would be interested in having her at your school or event. Jenny's journey to becoming an author, and about her books. Writing activities can be included. Jenny can run creative writing workshops on a variety of topics related to her books. Jenny calls this her 'Wonder Talk'. If you have read the book Wonder, by R J Palacio or watched the movie this talk is for you! Jenny covers what diversity means; how we are all diferent from each other; what facial differences are; my life (and my children's) living with a facial difference, including bullying and Hollywood's villains having facial differences; and strategies for talking to people who are different to us. 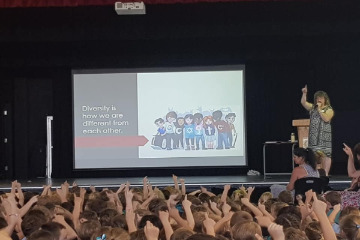 The talk can be adapted to lower, middle and upper primary, and Year 7s. Jenny's journey with her 11-year-old daughter who has Down syndrome. Her initial reaction to the news, and then her vision purposefully made decision for her daughter to go to mainstream school and have an ordinary life. What is inclusive education? (Having children with disabilities in mainstream schools and being fully included in all school activities). The research on why inclusive education is best for all students. Strategies for implementing good inclusion. Jenny's journey as a parent but also with a teacher perspective. The barriers she has come up against and the successes she has achieved for her children, but particularly her daughter who has Down syndrome. 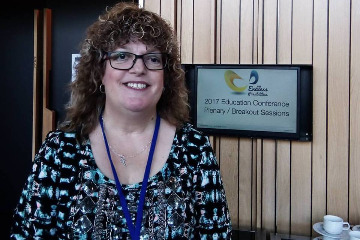 Jenny's life has been riddled with struggles- growing up with a facial difference, constant bullying at school, a domestic violence marriage, being suicidal, bouts of depression, Generalised Anxiety Disorder, children with disabilities and high medical needs, trying to be a supermum... Over time she have learnt particular strategies and mindsets which has helped her to cope. From the moment we are born society pins labels on us - the first one is normally girl or boy. Over time more labels are added - some positive, others negative. What we believe and how we internalise these labels affects our self-esteem and our self-direction. The effects of social media and Hollywood on labels and our perceptions of beauty don't help. Jenny gives strategies to tear up the negative labels so you can be the person you are meant to be. As a child I had a 'why me?' and 'this isn't fair' mentality. Being bullied on a daily basis for how I looked, and lots of rejection, gave me a low self-esteem and lack of self-confidence. Over time I discovered some mindsets to overcome these victim feelings, and to lead a fulfilling and happy life. This is a discussion of the world's labels that we have pinned on us, versus the labels that God from the bible for us. This talk includes an activity where we destroy society's labels and let God begin to heal us. This talk is great for a Ladies Night function. Hear about Jenny's Christian journey and her proof that God never promised us an easy life. Her lesson she learnt through her life of struggles is that no matter what happens to us, God never leaves us, and is looking after us, even if we cannot see it at the time. And over time God will use our experiences to help other people and fulfil our destiny; and ultimately to bring glory to Him.